When selecting a new heating system it is important to find a balance between achieving a high output and maintaining energy efficiency. Justin Jearum, Commercial Product Engineer at Alpha Heating Innovation, highlights how modular or cascade systems can provide an appropriate solution. Reducing emissions from non-domestic energy usage is a constant challenge for local authorities that are obliged to ensure they are doing what they can to promote energy efficiency. Up to 60% of a building’s total energy use can be attributed to heating and hot water usage; as such, replacing an outdated heating system can make a significant difference to a building’s overall energy efficiency. When specifying a heating system, the first considerations should be the required kW output and the location. Buildings can have a range of demands to fulfil dependent on age, usage, hot water requirement and radiator count. You should establish whether the previous system adequately met the needs of the building and whether the building’s use has changed since its installation, considering any extensions to the site and allowing for the demand of extreme weather conditions and thermal losses. Once the kW output has been calculated, boiler room size and access routes need to be considered. 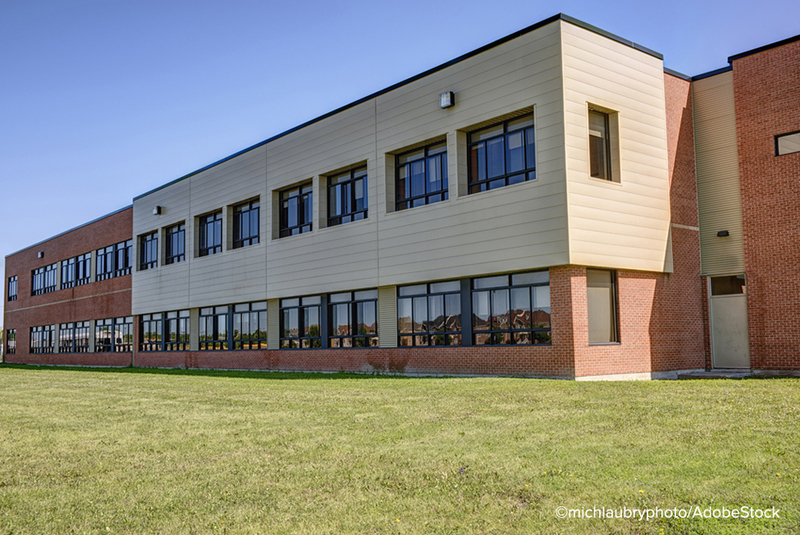 Many older school buildings, for example, will have cramped basement boiler rooms, while more modern locations may have higher-level plant rooms where footprint may not be an issue. Access routes will also vary across locations. Conducting a site survey will help find the most appropriate route. 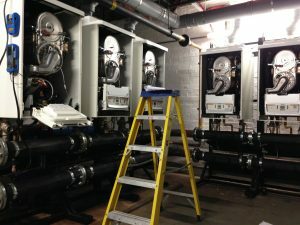 A cascade system is a good way to combat a lack of space in an older building, connected side-by-side or back-to-back, to produce an output of up to approximately 600kW while keeping spatial footprint to a minimum. Larger heating projects especially can often benefit from multiple cascaded boilers, as this allows for a higher turndown ratio. This is particularly useful for light commercial premises such as care homes and community centres that have widely varying heating and hot water demands throughout the day. Alpha’s ProTec Plus light commercial boilers are ideal for such applications and are available in four outputs from 50 to 115kW. When arranged as a cascade system, these boilers can generate almost 600kW, dependent on demand, or as little as 5kW if necessary. A range of accessories is available with ProTec Plus boilers, enabling flexible space-saving solutions, offered by side-by-side or back-to-back frame mounting. The even distribution of heat can be ensured via the use of an optional thermoregulation device, or boiler cascade manager, which the central unit controls, monitoring and programming the operating sequence of the other boilers. Up to three heating circuits and one domestic hot water circuit can be managed via sensors and room thermostats. A cascade system may also be preferable even when a single boiler is able to meet demand, as efficiency is increased when load is spread over more than one boiler. The cascading function helps to optimise the constant demands of the system while providing a rapid warm up time in response to multiple requests. If demand falls low enough, a single boiler can run on its lowest output, minimising energy use. This type of arrangement can also significantly increase the longevity of a system due to the even distribution of load across appliances, which decreases the risk of deterioration on individual boilers, as breakdowns can be costly in locations like care homes and schools. Cascade systems also allow for redundancy — a key requirement for commercial buildings that cannot afford any downtime, such as hospitals. In the unlikely event of a boiler malfunctioning or needing maintenance work, the other units in the cascade system can continue to heat the building without disruption, spreading the load of the missing boiler between them. Where space is at a premium and a floor standing system can be accommodated, a modular condensing boiler is an ideal choice where a heating fluctuation with a higher maximum output is required. An alternative to individual cascade systems, modular condensing boilers can generate anywhere between 12 and 900kW depending on model and necessity. Like cascade systems, these boilers are especially suited to schools and healthcare facilities, as they can respond to fluctuations in daily demand far more effectively than standard commercial boilers. Encompassing a series of combustion chambers within a consolidated unit, the modules of a single modular condensing boiler are able to run individually or together like a cascade system. Modular condensing systems can also continue to operate without disruption on a reduced number of modules should maintenance work be necessary. All modules can also be easily accessed via the lid of the casing, allowing servicing costs to be kept to a minimum. Furthermore, to ensure optimal efficiency, these systems self-modulate, only firing up when required, which minimises wasteful boiler cycling and keeps energy waste to a minimum. Multiple or modular heating systems bring valuable advantages over standalone single chambered boilers in commercial or institutional environments, offering increased efficiency, higher turndown ratio and the benefits of optional redundancy and greater longevity.